IKEA is running “Climber”, a television commercial in which a man climbs a wall to prepare dinner. He navigates cupboards, appliances and table settings in a quest for a renovated kitchen and dining room. “Nu har vi fler vitvaror än någonsin” (Now we have more appliances than ever). 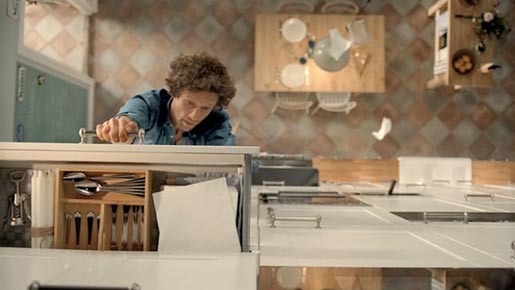 The IKEA More Appliances commercial was developed at Forsman & Bodenfors, Stockholm, by art director Silla Levin, copywriters Marcus Hägglöf and Rickard Hallberg, agency producer Magnus Kennhed, working with IKEA project manager Maria Bergqvist. Filming was shot by director Tomas Mankovsky via Folke Film, with producer Joi Persson, project manager Madde Otto, director of photography Göran Hallberg, and set designer Wilda Wilholm. Post production was done at The Chimney Pot. Offline editor was Thomas Lagerman. Sound was produced by Fredrick Frippe Jonsatter at Ljudligan. Online editing was done at Swiss. Music, by Burl Ives, is covered by Martin Landquist.